Here’s one last entry in my almost month-long series of reviews of ever-older malts, a series in which I have reviewed as many older malts as Serge reviews every Wednesday. Michael K. recently offered me a sample of this and I took him up on it saying I’d finished my own bottle well before the blog. That statement is true but, as with the Redbreast 12 CS, it turns out I had already reviewed it in the summer of 2013, when the blog was relatively new, and had just completely forgotten. Now I’ve got no shortage of never-reviewed whiskies (samples and bottles) on my shelves but it was sort of interesting to re-review that Redbreast and also this Ben Nevis recently, and so I decided I’d give this another go as well. I have not looked at my previous notes or exact score again before this second go-around. Let’s see if I come up with much variance. 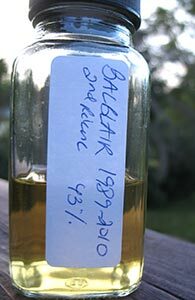 I’ve not had a very good showing with the two official Balblairs I’ve reviewed so far, but I have had a pretty good run with the A.D. Rattray bottles I’ve reviewed. So, what’s it going to be with this Rattray Balblair? Will the Rattray mojo prevail? 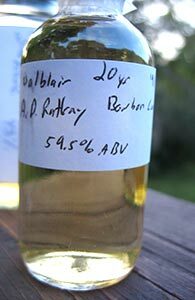 Will the cask strength allow Balblair’s qualities to emerge more fully? Let’s take a look. 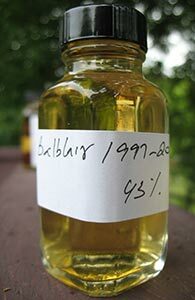 I reviewed the Balblair 1997-2009 some weeks ago and here now is the second edition of the 1989-2010 release. This got a fair bit of love when it was released; I liked it fine but it didn’t really rock my world. It’s got the northern Highland apples/pears/malt thing going on but turns out rather anonymous–which is not something that you want from an official release that’s at least 20 years old. Balblair is a distillery in the northern Highlands, up there in the general vicinity of Glenmorangie, Glen Ord, Clynelish, Dalmore etc.. I don’t think it’s ever been a particularly storied distillery. They used to make a solid 16 yo but no one seems to have ever got too excited about Balblair. As of a few years ago the distillery seems to have decided to try and change that. The bottles got a redesign–flatter bottles in great big square boxes–and the entire range got refurbished as well. Out went the 16 yo and age statements and in came vintage releases (borrowing a page from the Glenrothes playbook perhaps) of a range of ages. Of the initial lot, at least the ones that came to the US, this 1997 was the youngest and cheapest. It has since been succeeded by a 2000 and then a 2001 and most recently, I believe, a 2002–though I don’t think all came to these shores.